A new elastomeric vibration isolation bearing (patent pending) for less demanding applications. The LIP-175-912-01 is a 9 inch by 12 inch rectangular platform suitable for isolating smaller low to medium power microscopes when environmental conditions are impacting image quality. The platform is approximately one inch high and can isolate payloads up to 40 lbs. The Series 275 Lab Isolation Platform is lightweight and easy to set up. It is comprised of a sturdy, gray PVC platform with a neoprene, non-stick surface supported by three or four Series 275 Vibration Isolation Bearings. These bearings are passive, mechanical bearings that employ Vistek’s patented vibration isolation technology (US Patent No. 6,517,060, 6,520,283 and foreign patents pending (not pending-issued)). Our lab platforms can handle loads up to 52 lbs (24 kgs). Available in 3 different sizes: 8″ x 10″, 10″ x 15″, 12″ x 22″. 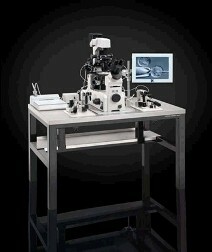 Vistek microscope platforms are designed to match the footprint of each model of microscope. This minimizes the workspace occupied by the isolation platform. Vistek platforms are also designed to be very low profile and when installed under a microscope they raise the microscope only 1 to 1-½ inches. Competing products typically require a supply of compressed air or nitrogen, come only in a few standard rectangular platform sizes, and typically raise the working height of the microscope at least 3 inches, which can create ergonomic problems for the user. Because our products are made to fit, there is not added height or bulk that standard platforms would cause. 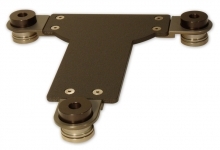 Our custom platforms fit the base of your specific microscope for a low profile, low weight solution to your vibration isolation needs. Please specify microscope brand, model and loading weight including equipment that may be attached to the microscope eg micromanipulator, patch clamp, video camera etc. 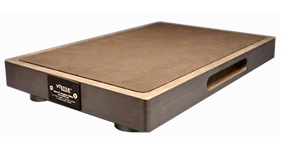 Anti-vibration Table are designed to meet the requirements of ICSI procedures. Vibration are eliminated by complex anti-vibration system achieved through an optimized choice of mass and support stiffness ensuring a fast dampening effect. The inverted microscope is placed on equilibrated and isolated platform, which gives a smooth and roomy workspace around the microscope for micromanipulation equipment, mini-incubators, patient records etc. 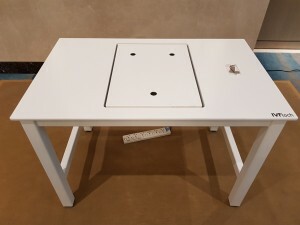 The table adjustable for all available models of inverted microscopes including motorized models.